Welcome to the Red Guard's Sniper section. If you would like to do a sniper impression, there's a few things you'll need to know. 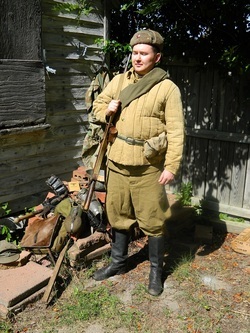 The role of the Soviet sniper in the Great Patriotic War has always been one of legend. 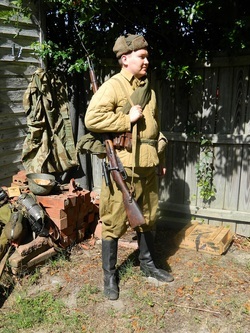 In the west, the most famous Soviet sniper is Vasily Zaytsev because of the film "Enemy At the Gates." Though the movie is a poor depiction of what the life of a Red Army sniper was like, it does expand the mythos of the sniper. The true role of a sniper is one of patience, skill, and resourcefulness. Their role was also extremely important psychologically. Not only were they an invisible threat that demoralized the enemy, they also became a symbol of resistance for the people of the Soviet Union. 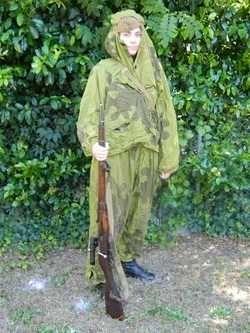 Both men and women in the Soviet Union could be snipers. With some snipers having over 300 confirmed kills, they were a force to be reckoned with. Soviet sniper tactics stemmed from the experience of engaging Finnish snipers in the the Winter War. They would evolve even more in the urban environment of Stalingrad. Most sniping engagements took place about 400 meters in rural fighting, and 100 meter in urban combat. 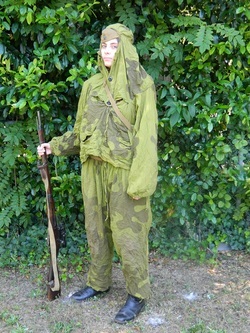 Camouflage was extremely important in these cases. 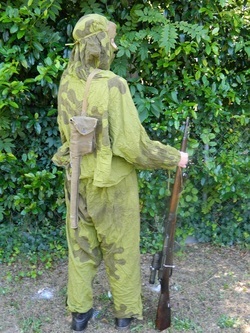 A variety of items were used to provide concealment. 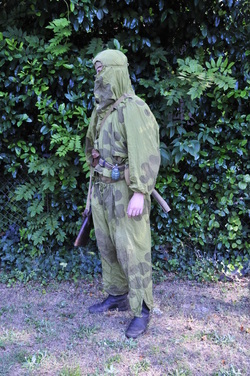 Plasches, camouflage suits, netting, burlap sacking, and even face make-up were blended with the surrounding enviroment to make the sniper invisible. A sniper team typically consisted of two people - a spotter and a shooter. The spotter's job was to observe and estimate distance, the other to fire. The purpose of the sniper was to engage important enemies like heavy weapons, communications, and especially leaders. After each spot, the sniper team would often move to a different location and the spotter and shooter would switch roles. Much like the snipers in the Red Army, our unit is looking for mentally and physically fit people to portay this impression. 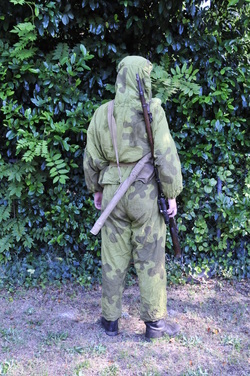 Though reenacting as a sniper is very different from being a real Soviet sniper (since the Facists won't know to take a hit from 1000 ft.) our unit would like us to keep to the same standards as the Red Army would have. Please no eyewear, unless you wear contacts, for this impression. 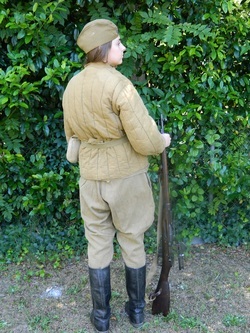 Snipers often worked in combination with the Red Army's scouts to support the mission objectives of their unit. Remember the sniper was an infantryman first, and this is why we encourage members who want to take on the sniper to be in the unit for a minimum of one year and attend at least two training events. Every sniper would of known his or her weapons inside and out. The sniper rifle is the bread and butter of the impression. There are a few guns that you can buy that would have been correct to the time period. 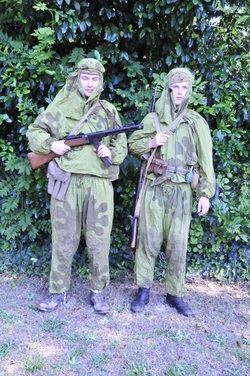 Sniper variants of the M-91/30 Mosin Nagant and SVT-40 Tokavev rifle were both used in the war by snipers. You must have proper mount, bolt , and scopes (PU, PE or PEM). In order to do this impression, you will need to have access to one of these weapons. If you have any questions about this please contact me (Brittany Stephenson) or the Kapitian. 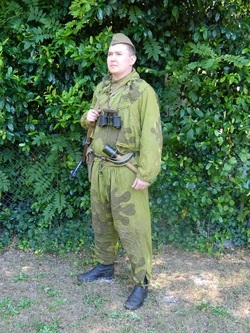 As for the uniform and equipment, you should own a basic infantryman's kit. 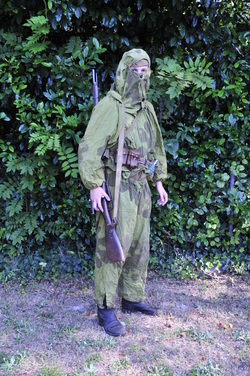 Other iteams you should consider for the sniper impression are any approved camo suits (amoeba suit) , time period netting, and platsch. Some other iteams you might want to get to make your impression top notch are binoculars, a compass, period note book (to log kills), and a periscope. Usually you will travel light since you need to be stealthy in the field. Snipers did have some awards for their efforts. Most noteable is the Excellent Marksman badge that came out around May 21, 1942. In order to wear this badge, you must be approved to portray a sniper, you must own/carry a sniper rifle, and portray a sniper for five events sequential events. Below I have listed some really helpful links and books for doing this impression. If you have any questions please feel free to contact me via email StephensonBD@hollins.edu or find me via facebook https://www.facebook.com/brittany.d.stephenson . 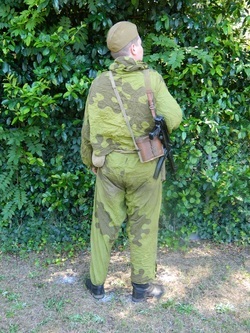 *** Below is a series of photos depicting different uniforms and gear for snipers and the various ways they are worn...please study them and read the captions. Notice no helmets usually for snipers. E tool stuck in back of belt. With full face mask worn. Notice, sniper's trench periscope in carry case. Notice that snipers wear only what they need, nothing more. 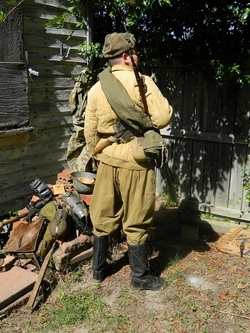 Our sniper depicted here wears a telegrieka padded jacket and pilotka garrison cap in the field. She prefers trousers to the regulation skirt. 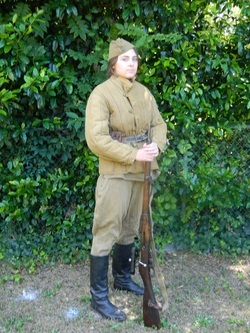 Full suit with hood worn over the field cap. 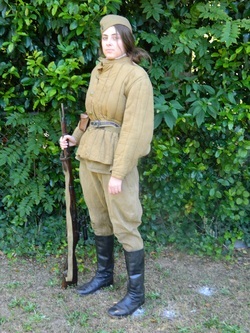 Irina carries M-91/30 Mosin Nagant rifle with PU 3.5 power scope. 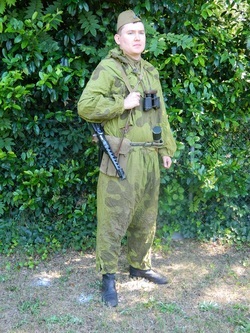 Vladimir wears standard field cap with subdued cap star, binoculars, and a PPS-43 sub machine gun. Notice trophy German stick grenade.